Fledgling Bluebird photo by Barry Hetschko. Imagine standing in a Garry Oak meadow in the Cowichan Valley. You hear a low chirp and look up and see a bright flash of blue fly by! You are seeing a Western Bluebird on Vancouver Island, a beautiful bird making a comeback after almost thirty years away. In approximately 1990, long time Cowichan Naturalist and mountaineer extraordinaire Syd Watts, now deceased, saw what was likely one of the last bluebirds in the Cowichan Valley on a hike with rare species biologist Trudy Chatwin and her daughters. Syd worked hard to encourage the birds’ return by placing nest boxes on Mount Tzouhalem and Richards Mountain, but to no avail. 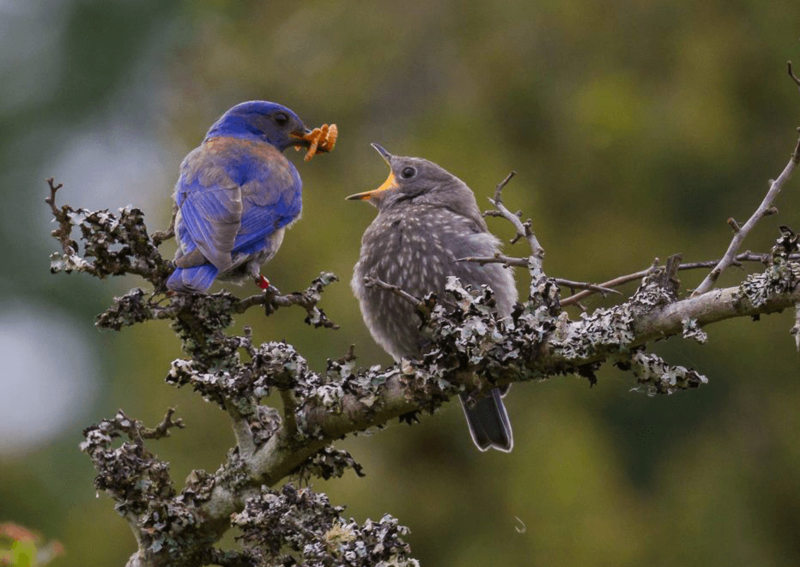 It was not until 2012 that Western Bluebirds returned to Vancouver Island when the Victoria based Garry Oak Ecosystem Recovery Team (GOERT) started moving Western Bluebirds, with permits, from Washington State to the Cowichan Valley. This was done under the supervision of avian ecologist and songbird recovery expert Gary Slater of Ecostudies Institute. Many nest boxes were placed in good Garry Oak habitat in advance of the Bluebirds arrival; fortunately, these first birds stayed to breed. In his final days of life, Syd was comforted by the knowledge that the birds were making a comeback. 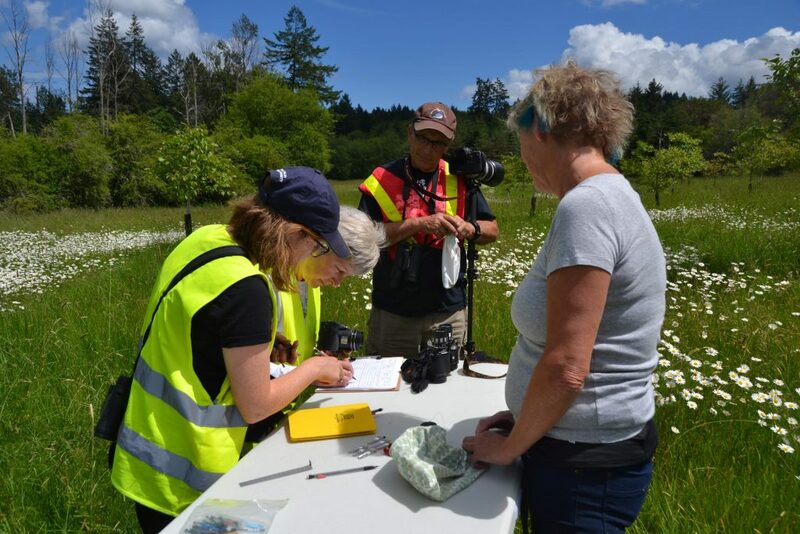 This past summer, under the lead of Cowichan Valley Naturalists Society (CVNS) biologist/conservation technician Hannah Hall, fifteen volunteer nest box monitors cared for their Bluebird Trails. This involved cleaning, fixing nest boxes and carrying out regular observations of the birds using the boxes. Over seventy landowners in Quamichan and Somenos Lake areas support the project, allowing a total of about two hundred and twenty-five nest boxes on their properties. While only a few of these boxes were occupied by Bluebirds, others provided safe cozy homes for other small songbirds including Tree Swallows, Violet Green Swallows, House Wrens, Bewicks Wrens and Chestnut Backed Chickadees. Songbirds are in a catastrophic decline in North America, so it is a wonderful side benefit that the Return of the Bluebird Project is providing habitat for other birds. Volunteers banding Bluebirds. Photo by Genevieve Singleton. It is thought that Western Bluebird became extirpated (locally extinct) from Vancouver Island due to a variety of factors. The main reason was likely increased farming and urbanization. Removal of trees led to a lack of tree cavities for Bluebird habitat. Increased use of pesticides and the introduction of invasive species such as House Sparrows were other stresses. Although beautiful, House Sparrows are very aggressive to Bluebirds and have been known to kill both adults and fledglings. Unfortunately, Bluebirds and House Sparrows require the same size nest box hole. Former CVNS staff member Ryan Hetschko, perfected the art of deterring Sparrows with sparrow spookers, built by Naturalist member, John Wheatley. These consist of sparkling mylar ribbons attached to a small dowel placed on the top of the box. Bluebirds like to fly up into the nest box hole, whereas Sparrows like to fly down. Since Sparrows do not like the pieces of myler flying in their trajectory, they leave the box alone. That’s innovation! Habitat Conservation Trust Foundation supported this project from 2013-2018. For the past two years Cowichan Valley Naturalists have been the lead of the project, taking over on the strong foundation built by GOERT. CVNS was thrilled to have one hundred per cent nest success this year. This year, fifteen adults were seen on southern Vancouver Island producing forty-two fledglings. Over the past year, over sixty volunteers put in thousands of hours completing a wide variety of activities ranging from project management, fundraising, checking boxes, visiting land owners, providing technical expertise and education outreach, and much more. How Can you Help the Bluebirds? If you see Bluebirds on Vancouver Island over the winter, email your sightings to cowichanbluebird@gmail.com. Bluebirds typically migrate south, but recently a few have stayed around for at least part of the winter. You can learn more about the project at www.cowichanbluebird.ca or attend the public CVNS talk at the WildWings Festival Oct. 27, 7 pm at Vancouver Island University, Duncan Campus. A version of this article was previously published in the Cowichan Valley Voice. Photos provided by Barry Hetschko and Genevieve Singleton. Thank you to Hannah Hall for additional assistance.